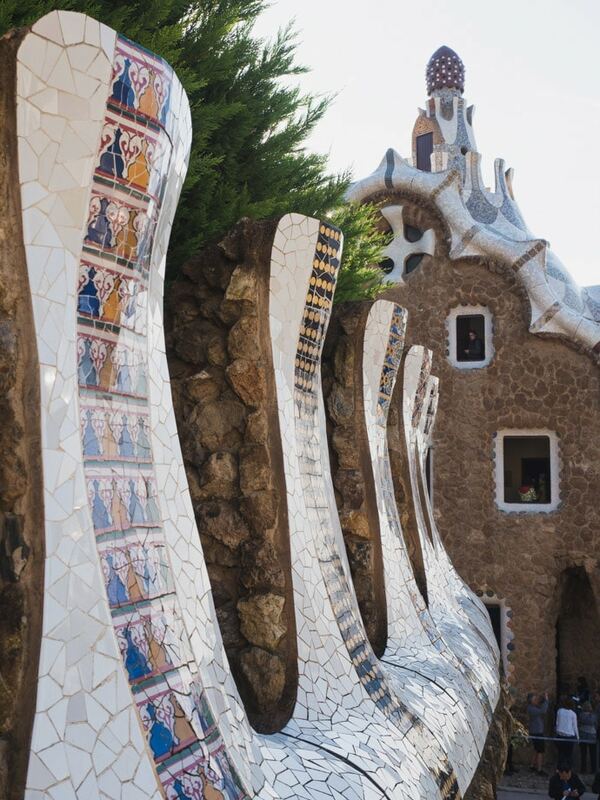 Visiting Park Guell and other Antoni Gaudi buildings is one of the most popular things to do in Barcelona. Their unique, quirky and detailed designs are fascinating to discover. 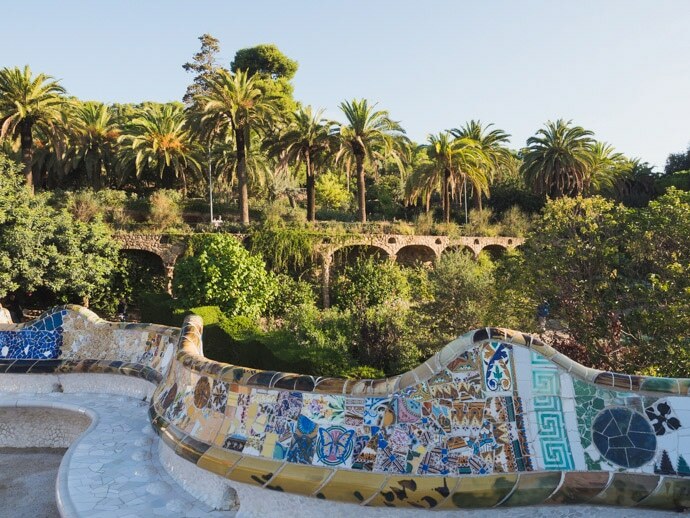 Park Guell has the best of both worlds, combining beautiful nature with stunning manmade designs. 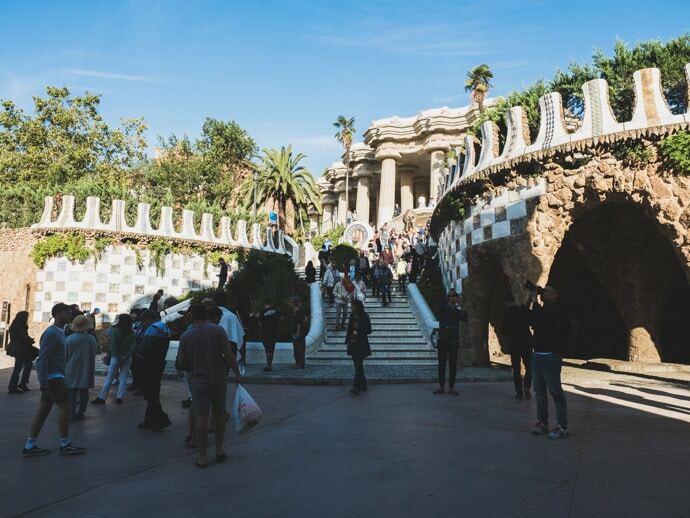 But, as we discovered, it can be a little tricky to figure out how to get to Park Guell, what entrance to use, and what type of transport is best. 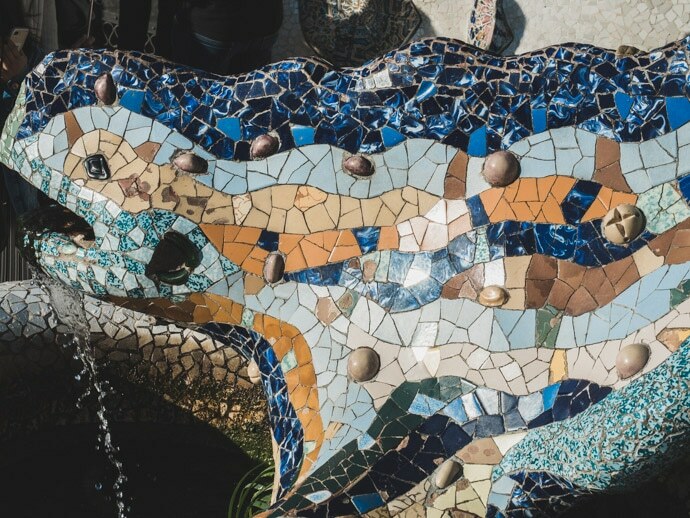 So here’s our guide on how to get to Park Guell and Park Guell tips so you can make the most of it. Wealthy entrepreneur Eusebi Güell originally commisioned Antoni Gaudi to complete Park Guell as an exclusive residential area. Work started on Park Guell in 1900 and was halted in 1914. The original proposal as a residential area never really took off, so the park was later sold to Barcelona city and open to the public to become the Park Guell we know today. Things to see at Park Guell include the serpentine benches and nature square where you can get beautiful views of Barcelona, the porter’s lodge pavilions near the main entrance, the mosaic salamander or dragon and the dragon stairway, the hypostyle room with all the columns below nature square, the laundry room portico and Gaudi House Museum. 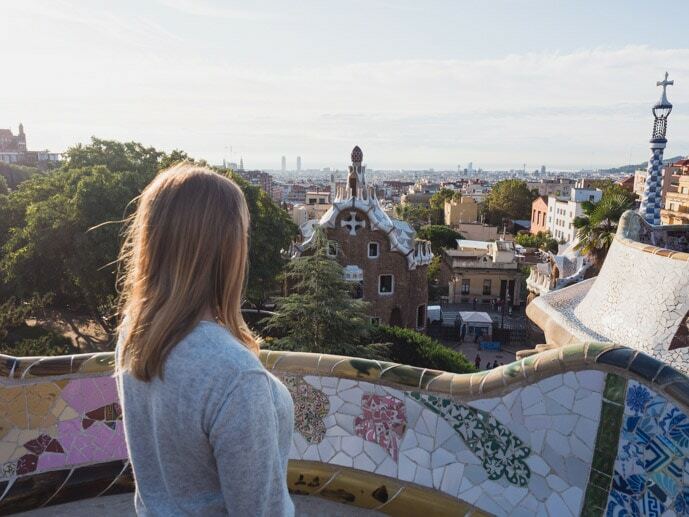 There are three main options for getting to Park Guell; bus, metro or taxi/uber. 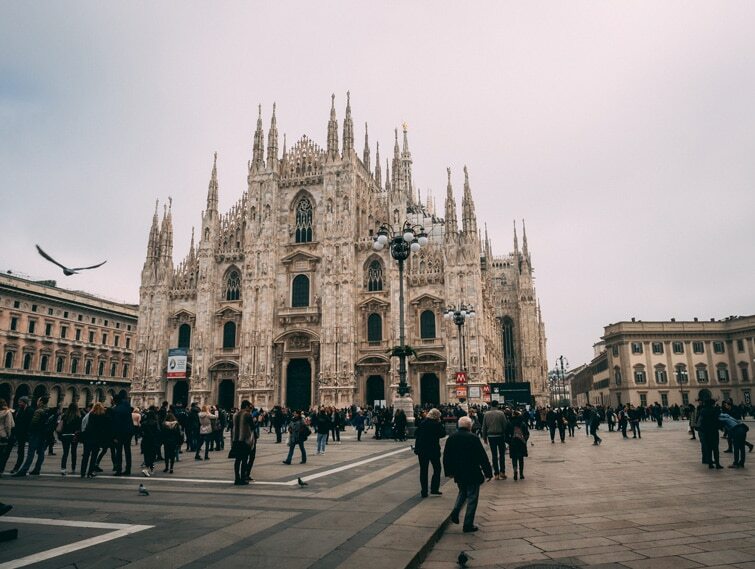 The bus will take you directly to an entrance but it may take a little longer and it also depends on where you are staying to see if this option is good or not. Bus 24 is the bus to get from Placa Catalunya to Park Guell (via Passeig de Gracia). How to get to Park Guell from Sagrada Familia? Bus 92 will take you there. Both bus 24 and 92 will stop at Carretera Carmel-Park Güell which is one of the main entrances. There is also the tourist bus which has Park Guell as a stop. The most expensive option but also the easiest is to get a taxi/uber to Park Guell. Obviously, this doesn’t involve you needing to know instructions, eliminates walking and is a good option when travelling with a couple of people. We chose to get to Park Guell using the Metro. This made the most sense for us as we were staying right near the green line metro (L3). We got the metro to the Vallcarca stop. This part is all very easy, but once you get off the metro you have to walk and use the Park Guell escalators to get to the side entrance. Most of the uphill sections are taken care of by the escalators but there is some uphill walking. The walk has some signs but can be a little confusing. We made a video of our walk from Vallcarca metro to Park Guell so you can follow what we did before you go. 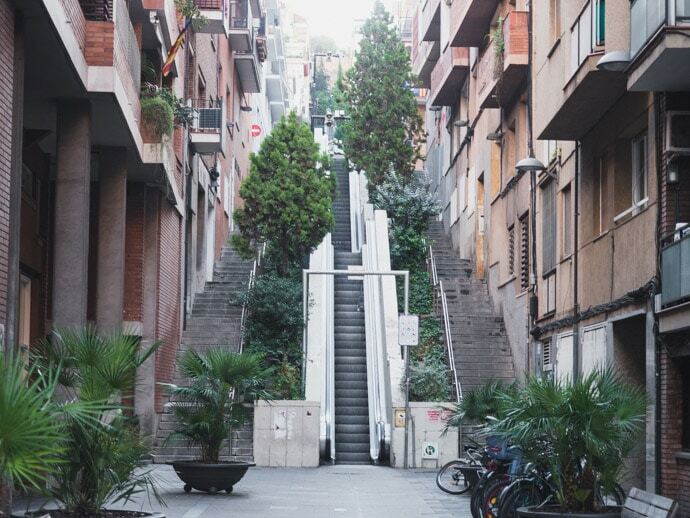 Essentially though, you take the Baixada de la Glòria escalator plus a few other streets to the entrance on Passatge de Sant Josep de la Muntanya. 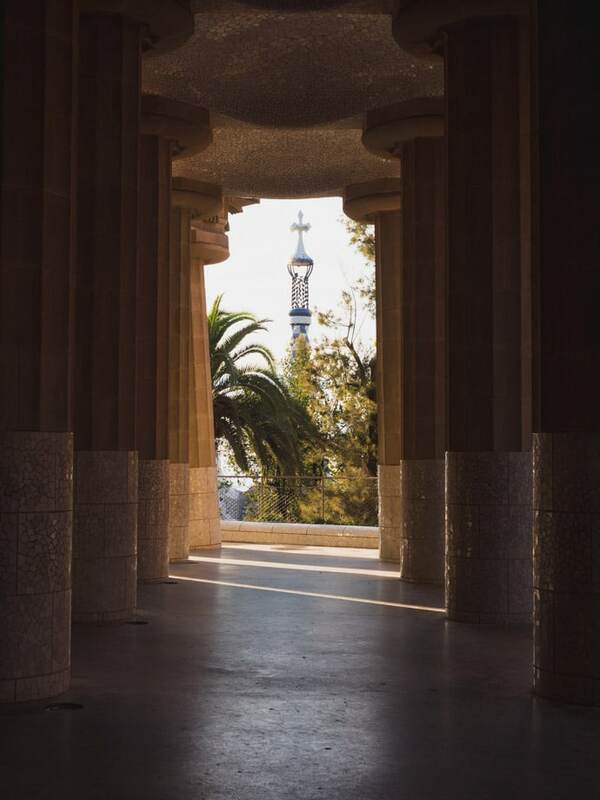 From here, you start near the top of Park Guell monumental zone (the paid section where you will find the Gaudi structures) and walk downhill through it and finish at the main entrance. When we left Park Guell, we walked downhill through Garcia, back into the city centre. If you don’t want to walk, you can also get the metro back, and it’s probably easier to walk downhill to the Lesseps station on the way back. 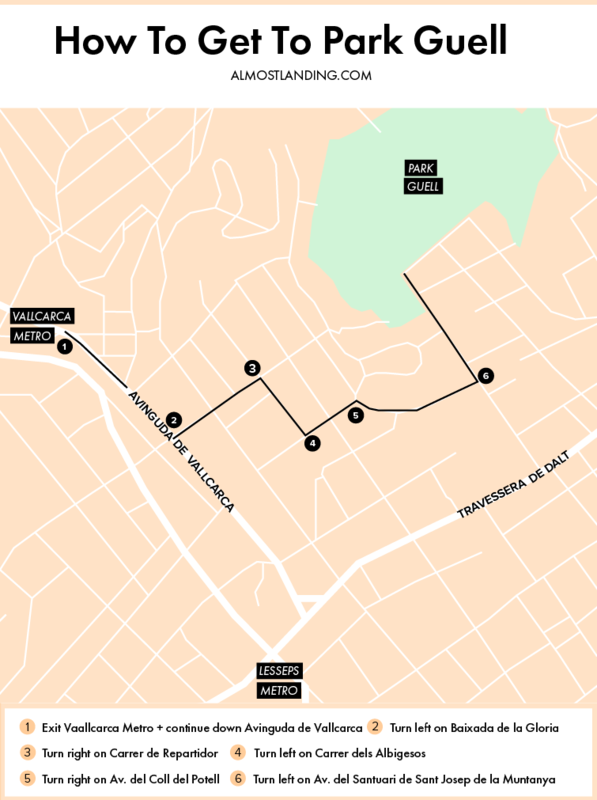 Here are directions and a map for how to get from Vallcarca Metro to Park Guell. Get your printable Park Guell Map PDF here. 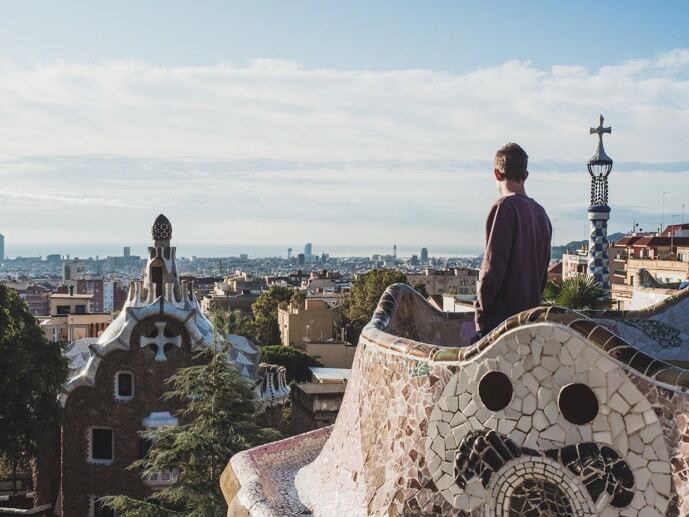 What Is The Best Time To Visit Park Guell? We visited Park Guell in the early morning, in the second timeslot at 8.30 AM. There were noticeably fewer people within the first half hour of our visit, and after this, it got busier and busier. We were so happy with our timeslot and it was worth going half an hour earlier to have way fewer people. If you can, the first timeslot of the day is probably best. Otherwise, I would imagine the last couple of timeslots of the day may also have fewer people or at least be close to sunset for beautiful shots. 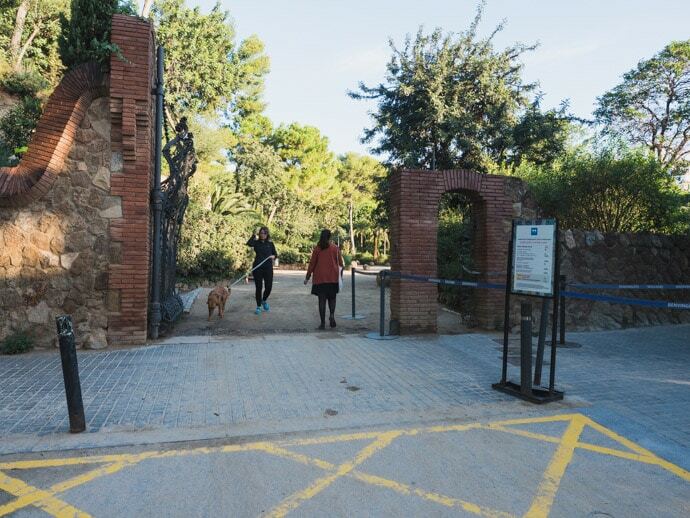 The low season opening hours of Park Guell are from 8.30 AM to 6.30 PM. The mid-season opening hours are from 8.00 AM to 8.30 PM and the high season opening hours are from 8 AM to 9.30 PM. 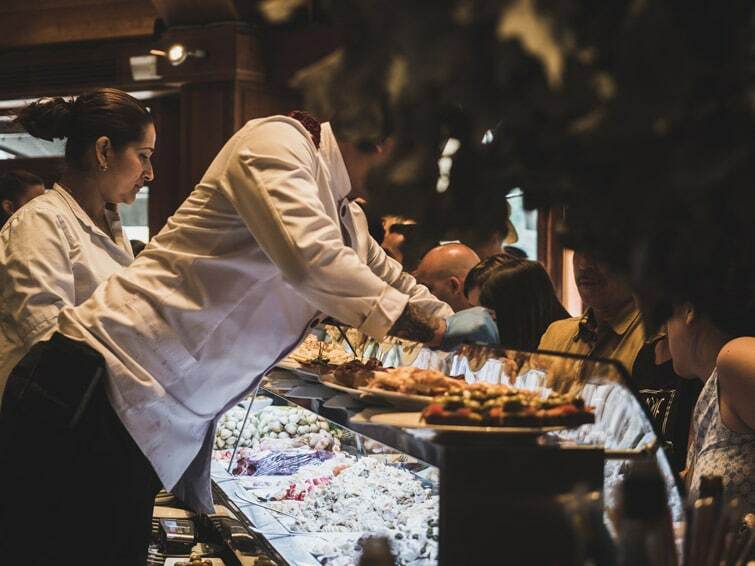 Find specific dates, current opening times and rates here. 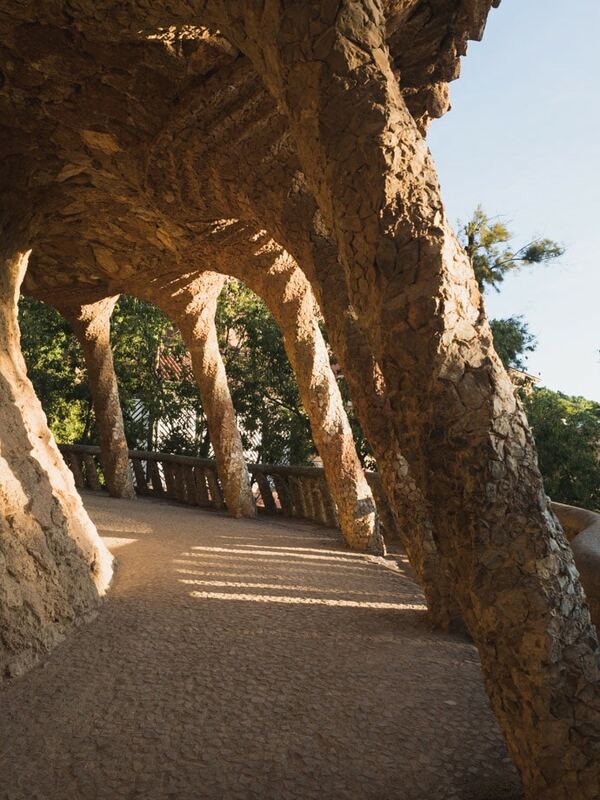 You can get free entry to Park Güell with the exception of the monumental core which is paid. 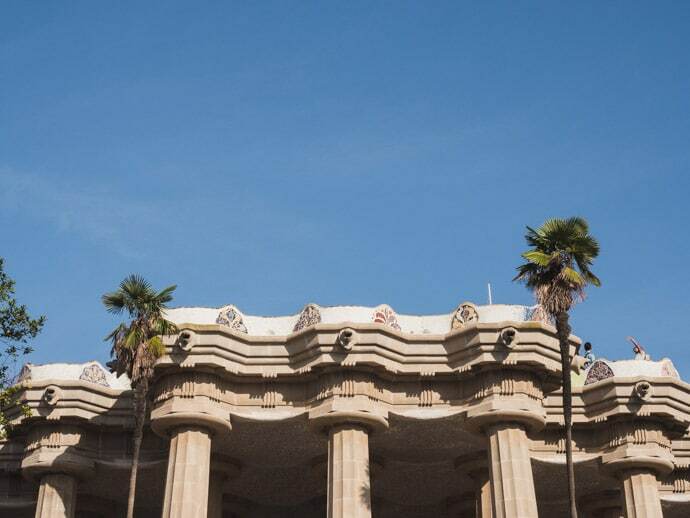 The monumental core is also the part that you most likely want to see, with all the beautiful Gaudi structures. Purchasing tickets online in advance is not only slightly cheaper than buying them there, but you will also be able to choose the time slot you prefer. Tickets are purchased for specific entry times and you have up to 30 minutes after that time to enter. This is because numbers allowed in the Monumental zone are restricted at any one time. Once you are inside, you can stay as long as you desire. 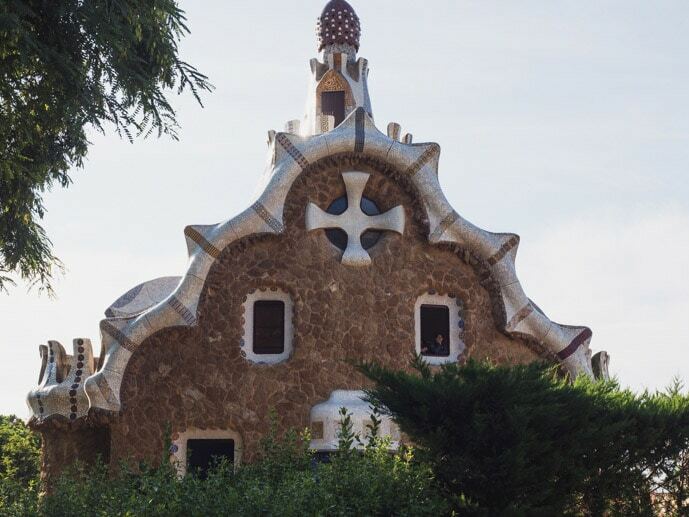 If you purchase your Park Guell ticket online, it’s ok to show the ticket on your phone rather than printing it out too. 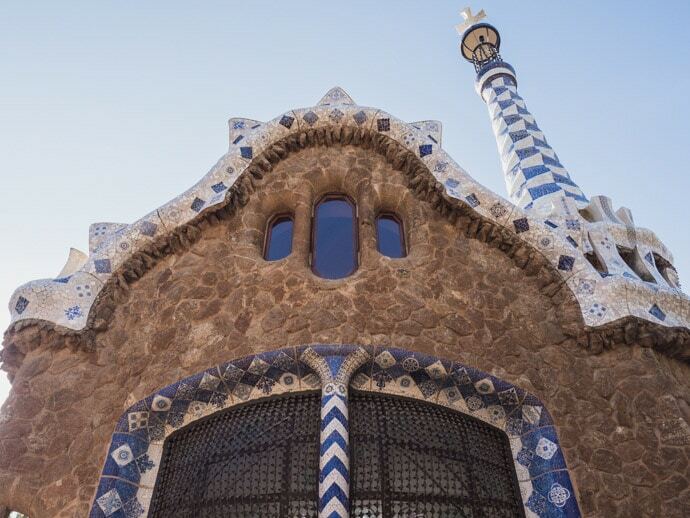 You can buy Park Guell tickets online here. 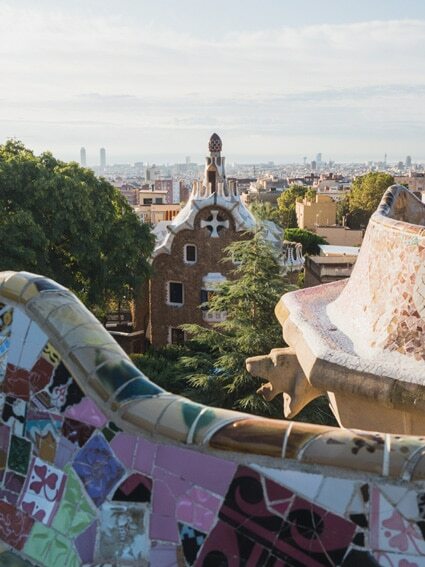 A general ticket to Park Guell is €7.50 when purchased online and €8.50 at the ticket offices. Have you been to Barcelona? Let us know if you have any questions or suggestions in the comments below… we’d love to hear from you.